Don Warrington in King Lear at the Royal Exchange. Photo: Jonathan Keenan. Eyes have mass in King Lear, whether that’s the metaphorical pull of the gaze or the literal give as you tear them from a duke’s head. The Royal Exchange’s main stage turns centrifuge in its co-production with Talawa, the collective gaze of hundreds of eyes on all sides, on three levels tearing hungrily at the spectacle of this earthy epic. Signe Beckmann’s set design raises a walkway: a hollow circle, met at opposite ends with runways to give the shape of the centre of a pokéball or some alchemical symbol. The surface is as if slate, covered by a fickle layer of dirt and trampled grass. It is tension, it is tearing-apart-and-opening-of-the-earth. 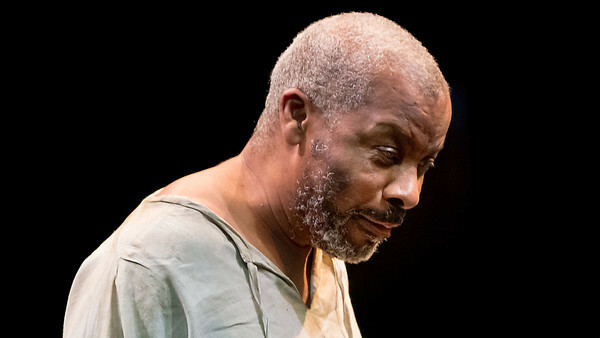 Don Warrington plays a subtle Lear. By which I mean subtle for a Lear. By which I mean Warrington’s performance accepts that Lear is an Old Man, or at least a man who specifically feels too old. We see a Lear running, exhausted and heavy from the start, the shedding of his crown, robes and clothes throughout the play are brief, unfulfilling stabs at release from a burden that cannot be shrugged off. Rakie Ayola, Debbie Korley and Pepter Lunkuse – as Goneril, Regan and Cordelia – have, to a woman, the most gorgeous braids. And Ayola and Korley give evil performances. Poor Lear never stood a chance. All the ingredients in this production make every appeal to sight, nature and tradition already in Shakespeare’s script burn in the mind’s eye. Miltos Yerolemou’s Fool’s often desperate half-serious chiding of Lear in particular manages to provide a key to the entire performance in his seeming-nonsense talk of eggs. Sure, props to Shakespeare for making egg-cutting into a mega metaphor but massive props to Yerolemou for giving those mad old words such significance. For a 410-year-old play about power, the ways the themes are expressed are surprisingly yonic; everything is openings, splittings and fallings. Edmund and Lear both align their fates to nature, serving to demonstrate nature’s disinterest in morality, which delivers graves to them both. As Edmund and Edgar fight, they cast aside their swords, fighting with their hands. Edmund, who has only invoked nature, is conquered by Edgar, who has lived in the land, coated with mud, in the guise of a mad beggar. The semblance of surrender is not satisfactory – it requires sacrifice, which Lear, Edgar and Gloucester deliver in heavy spades. The elements force aging, leaking: madness and liquid, those early modern feminising signifiers. The jellies Cornwall plucks from Gloucester’s sockets split and squirt across the stage. In the storm, the heavens open and the front-row audience realise they are in a splash zone. King Lear is a play of splits and tearings-apart. Warrington’s very voice splits and squeaks as he is gradually made frail by his age and thankless surrounds. Blood aplenty is spilt. The world is weakened. King Lear is on at the Royal Exchange until 7th May 2016. Click here for tickets.